Hi again, this time I’ll post my little experiment concerning sampling rates. I attented to a discussion about sound quality of digital plugins on a Finnish forum. The discussion got me thinking about how sampling rates might have an effect on digital artifacts and what happens when you use higher sampling rates when the final product is supposed to end up to the CD-format with 44.1kHz sampling rate? My expectation was that converting sampling rate from 96kHz to a lower one was going to introduce some kind of distortion or increased noise in the signal and higher sampling rate could possibly have lower audible noise to begin with. I was quite sure about it before I actually did my test. I don’t know if it was very scientific or if it was done properly, because the outcome was completely the other way around from what I expected it to be. So here’s a picture of my little experiment showing what I found out. 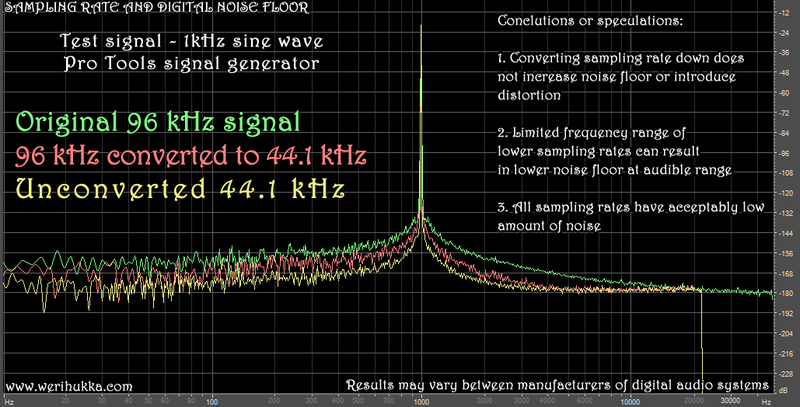 Higher sampling rate actually resulted in higher audible noise for whatever reason and converting higher rate to a lower one actually decreased the noise floor instead of increasing it. I don’t understand how noise can be decreased when it’s already there in the file. I also checked that the overall level of the test signal didn’t drop after the conversion, only the noise. Even less noise was produced by making the test signal completely using the lower 44.1kHz sampling rate. You should note that the noise is not very audible in any of the cases. The test was done in Pro Tools and the result was the same even if I did the conversion to 48kHz sampling rate. There was only a difference in level, but all of them followed the same principle of decreasing the noise with the exception of 88.2kHz conversion to 44.1kHz which did not decrease noise for some reason. Atleast not as much. The analysis was done with Adobe Audition FFT-analyzer with the highest possible accuracy. I have no idea how accurate these tests are, but it sure looks quite obvious that there’s more noise generated with the higher sampling rate and it decreases after converting downwards. I’ll post an update when I get this thing sorted out, because it really is an interesting thing.